You’ve got questions, we’ve got answers! Everything you need to know, want to know, have to know about our photo engraved jewelry. We have compiled a list of the top asked questions about our Photo Engraved Jewelry. If you have a question about it, we probably cover it below. However, if you don't see your question listed below, or if you would like to speak with one of our team members, please visit our Contact Us page and we would be happy to help you. 1. How do I get my photo to you? There are three different ways that you can get your photo of choice to Jewelry Keepsakes. Upload on the product page. On the individual product pages of our photo engraved keepsakes you can upload your digital image right there on the page. There is additional space for the customer to add any cropping instructions as well and any additional engraving instructions. For those with their pic readily available and in digital format, this is the fastest and easiest way to get your picture to our engraver. Email the image. You can also email us the image you would like engraved. The picture can be emailed to sales@jewelrykeepsakes.com and we encourage you to include any cropping instructions and additional details about the photo that you would like our engraver to be aware of. Mail the actual photograph. If uploading on the product page and emailing the image are not an option, there is always postal mail. Pictures can be sent to Jewelry Keepsakes and you should reference your order number when you send the picture in. The picture will be scanned and then mailed back to you along with your photo engraved keepsake. 2. What type of file do you need? A jpeg image is best and we require a minimum of 400 pixels. If the pixels are lower than 400, the quality of the pic is significantly diminished. In order to provide the best quality image on the keepsake, 400 pixels or higher is required. 3. Can I see a proof? If a customer requires a proof before engraving we can absolutely provide that. Most times, with clear instructions on what the customer is looking for, our master engravers can do exactly as the customer asked. However, if a customer wants a proof OR if our engraver is not necessarily happy with the way that a picture fits on the requested keepsake or is having difficulty with cropping instructions, we reach out to the customer to get their approval of the proof before engraving onto the surface of the pendant. 4. Can I send in a polaroid? 5. Can you remove the background? Yes, we can remove any background from a picture. The photo can be cropped to your exact specifications and highlight exactly what the customer is asking for. The higher quality the image, the better the clarity of the resulting engraving. 6. Can you add in hair if it is missing? 7. Can you merge two people together? We absolutely can add people together! You can send in multiple images and request a merging of the people in the photo. Or we can take one person from one picture and a person from another photo and add both people onto one keepsake. Additionally, you can engrave both sides of the pendant. This allows for customers to choose two photos they love and have a picture engraved onto each side of the keepsake. 8. Can you engrave in color? No, we cannot engrave in color. The submitted picture can be black and white, sepia tones or color. The resulting image engraved onto the surface of the pendant will be black and white grayscale regardless of the color of the submitted image. 9. Does the photo come off? No, the photo is permanently etched into the surface of the pendant. The surface of the pendant can be scratched however so we do recommend that you don’t wear multiple pendants together or with other charms so as to prevent scratches. 10. What are my options for personalizing both sides of the pendant? You have several different options when it comes to personalizing both sides of your keepsake. You can put a picture on one side and choose personalized engraved text for the other side. You can also choose to have another image engraved on the other side of the keepsake. 11. Can I wear it in water? We don’t recommend it. Chlorinated water and water containing harsh chemicals can damage the surface of the keepsake and damage the engraved image. In order to preserve the beauty and longevity of the engraving and the keepsake, we suggest that you remove your pendant when showering, bathing or swimming and put in a safe place until you are out of the water. 12. Is photo engraved jewelry just to remember the deceased? Absolutely not! While photo engraved pendants are a wonderful way to show your love for someone that has passed they also can be used to celebrate those that are still with you. Ideal for birthdays, special occasions such as Mother’s Day, Christmas or birthdays, the pendants can be engraved with pictures of children, animals, any photo that holds particular meaning. Because the engraved image is in the exact likeness of the submitted photo, the personal nature of the keepsake is unique and special to the recipient. For those that are looking to choose a photo engraved keepsake in memory of the deceased, you have two different styles to choose from - those with an internal urn and those without an internal urn. The photo engraved pendants that have an internal urn will hold a memory such as a pinch of cremated ashes or a few strands of hair and can be engraved with your favorite photo. 13. What kind of chains do you have? We have several different types of chains to go with our photo engraved pendants. Each photo engraved keepsake comes with a 20” matching silver rhodium plated or gold plated chain. Additionally, we have premium chain upgrades. The premium chains are sterling silver and have been silver rhodium plated or gold plated and are available in 5 different lengths: 18”, 20”, 22”, 24” and 30”. This allows for great versatility for our customers and the chains are an exceptional value. All of our chains are snake chains and have a sturdy lobster claw clasp. 14. Can I hang it from a mirror?. Absolutely! 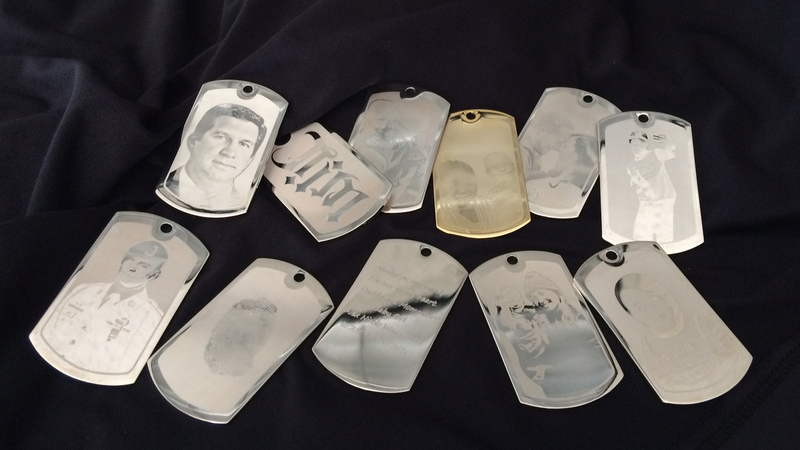 Photo engraved pendants can be displayed as a necklace or hung on a mirror or hung from the rearview mirror of your vehicle. You can use the included chain to hang from a decorative mirror or we have a clear filament with magnetized ends if hanging from a rearview mirror of your car. You can also choose a ribbon or some colored yarn or string to hang from a mirror. Endless options! 15. Can I get a discount by purchasing several?. We are all about passing on savings to our customers and we do offer discounts for purchasing multiple photo engraved keepsakes. If purchasing 5 or more keepsakes, use coupon code SAVE10 at checkout to save 10%. If you are purchasing 8 or more photo engraved pendants or a combination of 8 or more different keepsakes, use promo code SAVE15 at checkout to save 15% off your purchase price. 16. What is included with my photo engraved pendant? Every photo engraved pendant includes a matching 20” chain. The chain is placed under the display platform of the jeweler’s gift box that the pendant is placed in. The jeweler’s box containing the keepsake and chain is then placed in a beautiful presentation box. Those photo engraved pendants with an internal urn come with a filling and sealing kit as well as the matching chain. 17. How quick can I get my pendant? We offer a variety of shipping options no matter where you live in the world. For those that live in the continental United States, place your order by 12:00 noon MST Monday thru Friday and your order will ship same day. Standard delivery in the US is 3-5 business days. We also offer overnight and 2 day shipping in the continental United States. We offer regular and expedited shipping for Canada, the UK and worldwide. Please note that the receiving country’s customs department may impose tax or duties that are the responsibility of the customer. As always, if you have questions regarding shipping charges, please call our customer service department at 1-877-723-7229 and we are happy to help however we can. 18. What if I don’t like it? Can it be returned? We do not accept returns on personalized items. If you do not like your photo engrave pendant for some particular reason, our customer service department will be happy to assist you. You can call at 1-877-723-7229 or email them at sales@jewelrykeepsakes.com.